I'm writing this post after having spent my evening doing my first ever attempt at pumpkin carving! When I got the top off I was surprised to find a pumpkin is actually pretty much empty, I thought it would be full of soft squidgy stuff! It took me a fair while to try and get all the stringy stuff out and there's still quite a bit left in there. I'm not sure if this will be a problem or if it doesn't matter too much? Anyway, I didn't go for a standard face I went for a cat's face and I'm really pleased with how it turned out. If you want to have a look you can find a picture over on my Instagram. I'm not sure what inspired me to do this design. 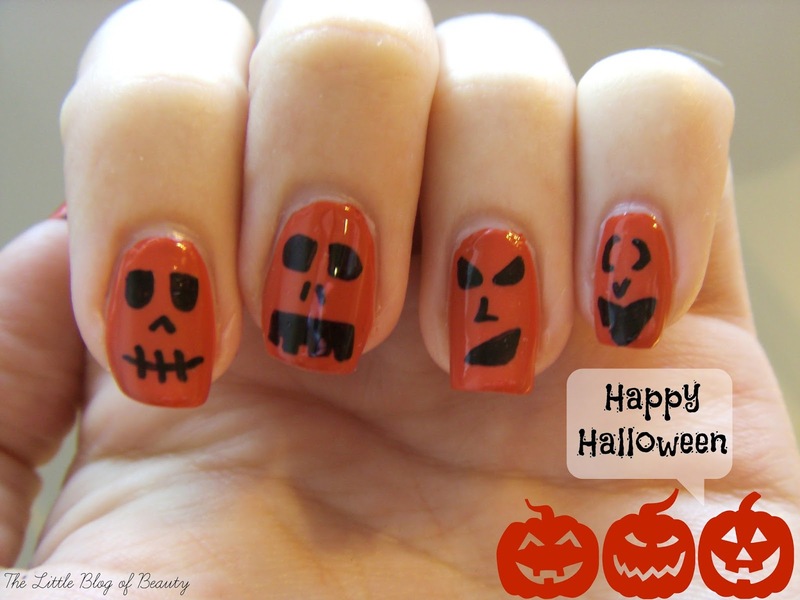 I have done another design using a pumpkin kind of shade, that I'll be posting early next week, and after I'd done that one I thought why didn't I just draw a face on each nail to make each one a pumpkin. I've not shown you my thumb nail because that was the first one I attempted and it went a little wrong. I always attempt a new design on my thumb nail first as if it does go wrong I can just hide my thumb and only show you the rest of my nails! My little nail didn't quite go to plan either but it doesn't look too bad. 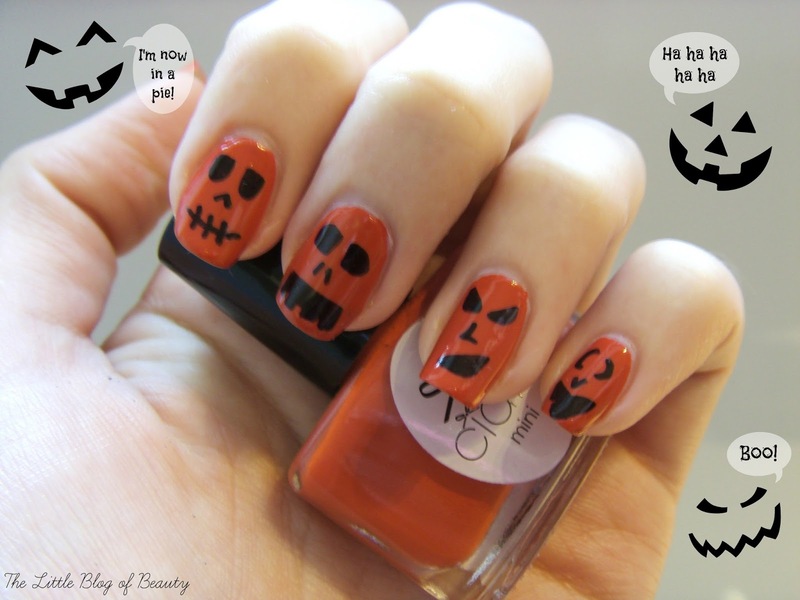 My base for this look is again a Ciate shade, all of my Halloween designs have featured shades from last years Mini Mani Month advent calender! This time I used Encore, which is described by Ciate as a muted orange, and is part of the Dragonfly collection. I would describe this as a toffee apple shade, or an autumn falling leaves kind of shade. It's really too dark to be a genuine pumpkin shade but I think it actually works quite well. All I did after applying my base was apply a top coat to seal it and then used my black Sharpie to draw the faces on and then gave them plenty of time to dry before sealing with a top coat. Sharpie's are amazing for precise nail art but you do have to be careful as they do smudge very easily when you apply your top coat. If you want to try using Sharpie's my advice would be to leave a good length of time before applying your top coat, maybe half an hour to an hour, and them cover your nail as quickly as possible, if you can manage it one or two quick brush strokes is best. 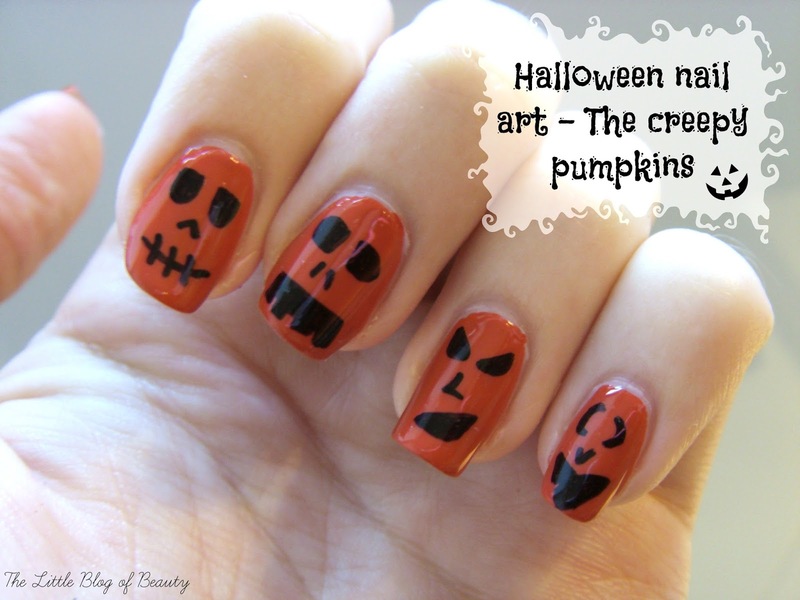 Unfortunately I had to remove this quite quickly, as I was in the running for a hand modelling job, but I think this was my favourite Halloween design, it looks amazing on your nails! What do you think of The creepy pumpkins?